Somewhere in the course of history, we all decided that games needed to be shorter. Modern games tend to slot somewhere between eight and ten hours to complete, but only a few years ago it wasn’t uncommon to log more than 40 hours into your favorite release. Rainbow Moon, the latest tactical RPG released by Sidequest Studios, seeks to reclaim those older days–a time when men were men, women were women, and children could log 300 hours into their favorite game without completing the main quest. We’ll start off positive: Rainbow Moon has some of the most adorable art you’ll find. Characters and environments are cheery and colorful, perfect for younger gamers. While NPC speech bubbles can be hard to read–blue text on a blue background is never a good look–menus are legible and generally convey the important information to the player. The threatening, but not overtly scary monsters would be a treat for younger gamers if there weren’t so many recycled, reskinned models. The isometric view does cause a lot of problems, though. You’ll find your path blocked by the upper branches of a tree, or rooftops–as though the player couldn’t walk behind them. Gamers looking for a complete audio experience might want to look elsewhere. Rainbow Moon doesn’t offer much by way of voice acting, and what little vocal work you’ll hear isn’t great. The music is largely forgettable, too–I found myself muting my Vita and turning on a podcast more often than not. [singlepic id=17724 w=620 h=350 float=]Presentation aside, once you start to play some of the battles, Rainbow Moon unravels. They seem simple enough–the player and the AI take turns pummeling each other until one side is dead–yet there’s something remarkably unsatisfying about them. Is it that enemy units have terrible AI? Is it the awkward control scheme leading you into tactical mistakes? Is it because the lack of skills and abilities make each battle a repeat of the last? All of the above, and more. There’s very little fun to be had in any of Rainbow Moon’s battles, which is a serious problem for a game that expects you to grind as much as this one does. So we finally get to length. Yes, Rainbow Moon is long. That’s great! Less great is that Rainbow Moon feels long. When a game expects me to log more than 70 hours, I usually expect it to take pains to keep my attention, but there’s nothing to hold onto here. The central goal–kill all the monsters, find a way home–is introduced in the first five minutes, and the rest of the game is little more than a series of fetch quests. Characters are mere statues, lacking any sort of interplay or personality. Rainbow Moon’s skeletal plot and paper-thin characters keep the player from becoming invested enough to keep playing. [singlepic id=17721 w=620 h=350 float=]What’s worse is that Rainbow Moon’s length is feels artificial. The slow dripfeed of new enemy types and character skills quickly reduces battles to tedium within the first few hours. The thin main plot leaves the player with little more to do than fetch quests and loot grinding. One time I spent ten minutes running back and forth between the same two NPCs–each ordered you to ferry a given item to the other. When you do get access to a new character, you’ll have to spend a few hours grinding to get their stats up to par with the rest of your team if you want to continue. You’ll even spend a lot of time in trite inventory management, fiddling with extra bags and spending gold on bag expansions. In fact, that might be the most distasteful thing about Rainbow Moon–it feels like a free-to-play game. Think about it: grindy gameplay. Subpar story. Slow character progression. Lack of drama or characters. Hell, Rainbow Moon even has a PSN storefront, where you can pay real money to eliminate most of the grinding. In a game you already paid $15 bucks for. 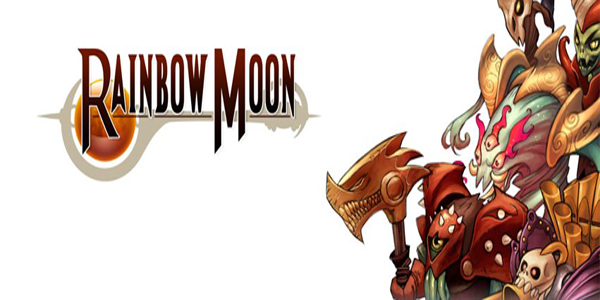 Rainbow Moon draws on all the worst practices of Free-to-Play MMOs while offering none of their advantages. It's a mediocre RPG with nothing to recommend it but its artificial, grinding length. If you’re looking for jRPGs on your Vita, you’ve got great options--but Rainbow Moon isn’t one of them.